Welcome to Get a Grip! Whether you are an independent business person or an employee, you are in business for yourself. Explore the great possibilities that await you. Have you ever heard someone say, "I can't seem to get my arms around it."? More than likely you have said it yourself. Get a Grip is designed to do just that - get a grip on your business. It's a way to look at your business and to apply some methods to improve its profitability. Let's first examine the principles then apply the tools provided. I will provide mnemonics (reminders) that will help you to easily remember the principles. I will describe each principle and how it applies to your business. I will give you exercises and worksheets to use. You will test yourself. When you are finished, you will have a better grip on what you do for a living. Look at your left hand. This hand represents the functioning segments of your business. Production: The first mnemonic is your left index finger - the power finger. It points the way. This finger represents the Production segment of your business. Value starts with production whether that is a product or service or both. Marketing and Sales: Your left middle finger extends beyond the others and represents Marketing and Sales. You need to get your product to market. Finance: The ring finger of your left hand, the one with gold, represents Finance. Money has to flow in and out. An enterprise needs cash to operate and to generate cash. R&D: Your left little finger, the finger of finesse, is Research and Development. This could range from laboratory work to reading a book. A business needs to stay current and hopefully ahead of its competitors. Tools: The thumb of the left hand is Tools. The thumb gives the hand the ability to grab and hold. You can't grip an object without a thumb. Tooling is an important part of business and applies to the other segments of the business. Look at your right hand. 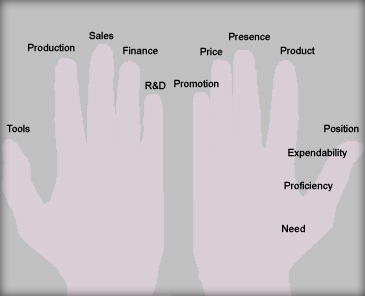 This hand represents the marketing segments of your business. Sometimes they are referred to as the "Five P's of Marketing". Product: The first mnemonic is your right index finger. This finger represents Product. This finger is paired with the left hand finger of Production. You need product to sell. Presence: The middle finger represents Presence: or how do you get your product to market; what distribution methods do you use? This finger also is paired with its left's conterpart. This is the delivery system you use. Pricing: Keeping with its counterpart, the ring finger represents Pricing. You need to get the price right. Too high and sometimes too low, you may lose business. Too low or too high, and you may lose income. Promotion: The little finger is Promotion. It takes finesse to promote something effectively. How do you promote your business, your product? Position: The thumb of your right hand represents Position. What makes you unique? What keeps you from being replaced in the market place? Let's focus on the right hand thumb. The thumb has two joints and three segments. Like the segments of the thumb there are three things that work in conjunction, dictating your business or personal marketing value. Marketing value means income. Need: The first segment of your thumb (the palm segment) represents Need. What is the need for what you do? Proficiency: The second and next segment represents Ability. What is your ability to deliver? How good are you at what you do? Expendability: Connected to thumb is the tip, the third segment which represents Expendability. How easy can you be replaced? These three segments are linked together as your Position in the market place. They provide a linkage between need and benefit for your customer. What does your customer need and how do they benefit from your product? Let's expand on Position; the need for what you do, your ability to do what you do, and how easily can you be replaced. To do that we need to look at your business or personal accomplishments. What was the need? What skill sets did you apply? Who benefited and how? The greater the need and your ability to meet that need coupled with how difficult it is to replace you or your business will dictate income. The Accomplishment Based Resume is one of the most powerful documents you can produce. It is a two edged sword. One edge is used for clearly stating to other people what you can do. The other edge is a reminder, a confidence builder of what you have accomplished. A by-product of the Accomplishment Based Resume is a list of skills that you applied to achieving the accomplishment called the Significant Skill Set. Still yet a by-product of the Significant Skill Set is the Fifteen Second Elevator Speech. The Accomplishment Based Resume is constructed from twenty-five (25) accomplishments. There are rules for writing each accomplishment. Get a copy of the Accomplishment Based Resume rules and instructions here. Once you have written your accomplishments, use the Significant Skills Set Worksheet to derive what skills you use most often. For each accomplishment, score a skill as applied or not. Add up the number of times you used that skill for all your accomplishments. Do this for each skill. Add the number of times you used the skill. The top six to eight scoring skills will be used to write your elevator speech. Get a copy of Significant Skills Set Worksheet here. Get an interactive XLS (Excel) copy of Significant Skills Set Worksheet here. Now that you have completed filling out the Significant Skills Set Worksheet you can begin to extract the skills and write an elevator speech. You will write it in three versions; to wit, expert, lay, and commercial. You understand your business using vocabulary your industry understands. An expert elevator speech uses the vocabulary of the expert. In most cases, your elevator speech is recited to people outside of your expertise. This means you need to write your speech in lay terms. But the job is not complete. Remember the need/benefit linkage? Write the speech so that it calls for action. Write it as a commercial. Get a copy of the How to Develop an Elevator Speech instructions and worksheets here.